The slide is one of the most identifiable visual characteristics of the trombone in artwork. However, when a slide turns up without a bell, it can be problematic. Could it still be a trombone? Are we trying too hard to make it a trombone? Was it just artist error? Artistic license? A mistake in a restoration process? A literal representation of some unusual permutation of the trombone? 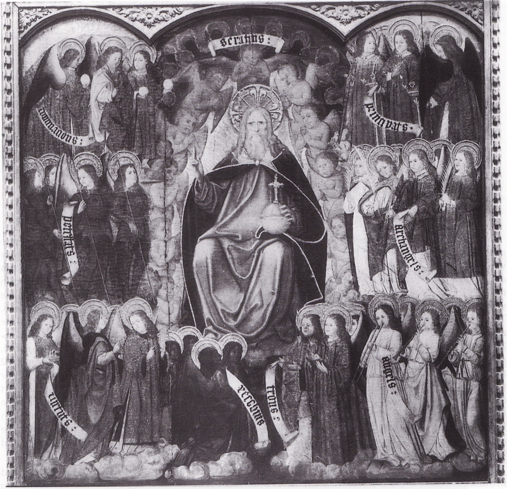 An obscured area of the painting? Some other instrument? They’re all possibilities, of course. I am not going to try to come to any real conclusions with this post, but I would suggest the early rear-facing trombone as one possibility. 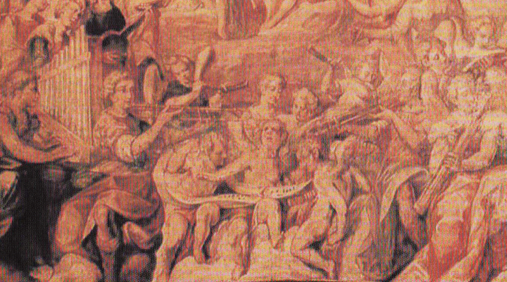 There are at least two iconographical examples of rear-facing trombones from the 17th century or earlier (see here), as well as many others from the 19th century (see here). In the case of the first three examples below with no apparent bells, the bell on a rear-facing instrument could easily be obscured by the player’s head and/or other parts of the image, such as cap, halo, and wings. 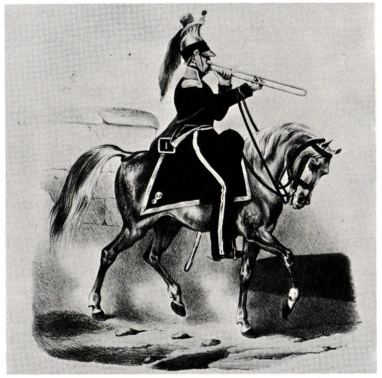 In the final example, from the 19th century, the bell is very likely obscured by the player’s helmet; there are multiple other examples of rear-facing trombones in iconography of this precise period and region. UPDATE: I have now located bells on all but one of the pictures (the first). See captions, images, and comments below. 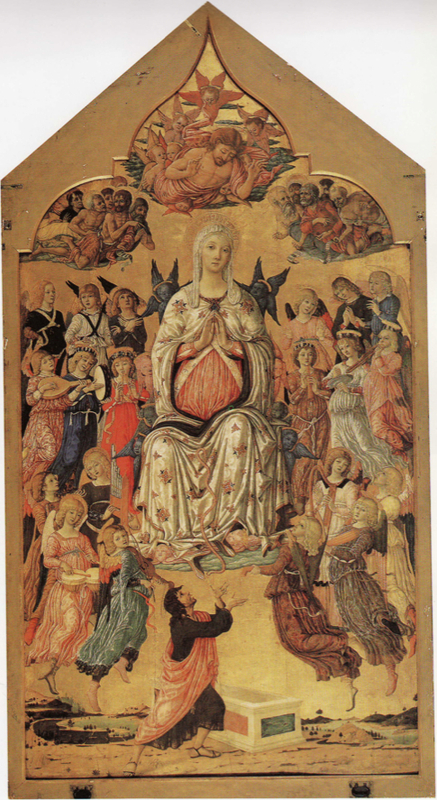 c. 1474—Asciano, Italy: Matteo di Giovanni’s The Assumption of the Virgin, the center panel of an altarpiece in S. Agostino, includes what may be an angel-trombonist along with several other angel-musicians. The instrument has what appears to be a slide but no visible bell (see below detail and full image; public domain) (Belán 111). 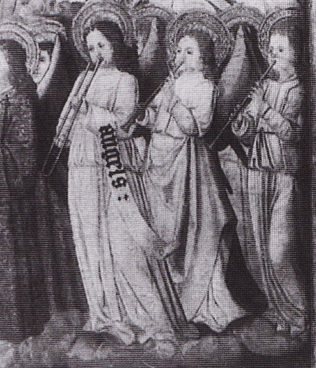 1503-1529—Spain: Joan Gascó’s painting, God the Father and the nine angelic choirs, includes what appears to be a trombone-playing angel, grouped with 2 other wind-playing angels, although no bell is apparent on the trombone (see below detail and full image below that; public domain) (Ballester). 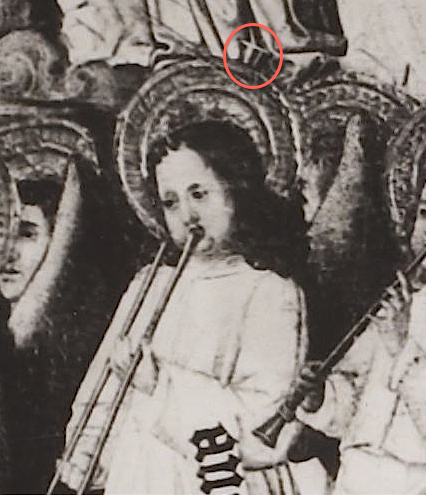 Update: I believe I found the bell in this painting; see Trombone Bell Found: An Early Rear-Facing Trombone, in addition to the 3rd and 4th details below. 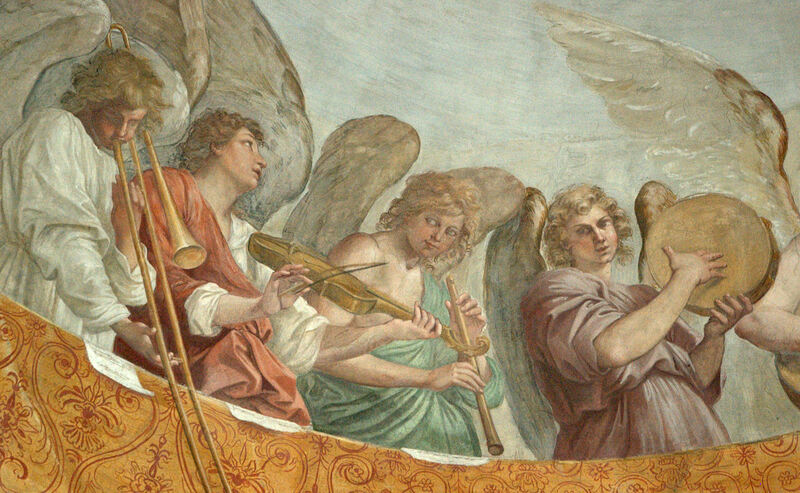 1598-1606—Valencia, Spain: Bartolomé Matarana paints a fresco of angel musicians in the the church of Real Colegio–Seminario de Corpus Christi that includes what are probably 2 trombones. 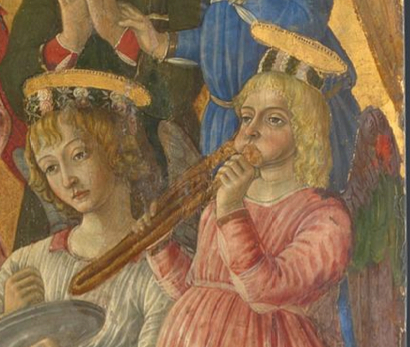 Only the slide portions are obvious, although possible bell flares can be seen upon close inspection (see details and full image below) (Olson, Angel Musicians). UPDATE: See comments, after this post. 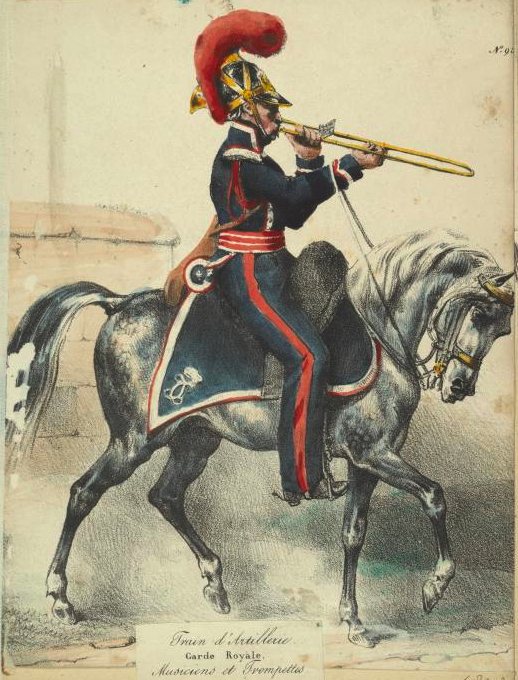 1828—France: An image from the Vinkhuijzen collection of military uniforms includes a trombonist on horseback playing a rear-facing trombone (see below image; public domain) (New York Public Library Digital Gallery). This image and the one above are obviously very close, but the colored one has a bell behind the player’s head. It is difficult to know which one actually came first, since the c. 1850 date is an approximation. …looks like one of these does have a bell, albeit a tiny one! 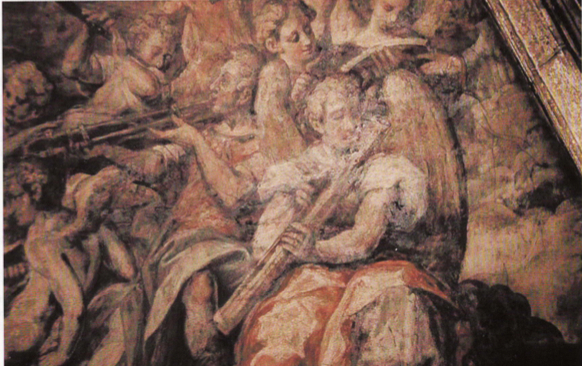 If you look very closely at the rightward-facing trombonist in the Matarana fresco, you can make out a bell shape just above and to the right of the player’s left hand, next to the cornettist’s elbow. The leftward-facing trombonist definitely does not have one. 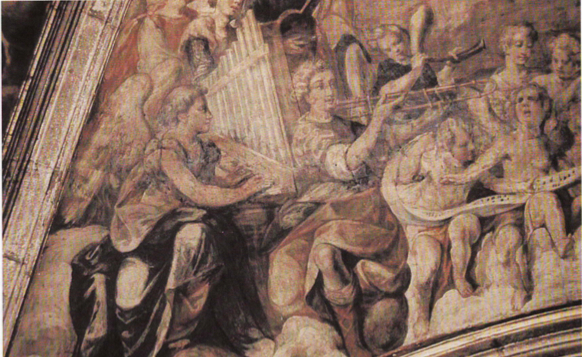 Strange that one trombonist would have a bell, but not the other in the same painting! As always, thanks for the fantastic posts! I’m always excited to learn something new on the Trombone History blog. 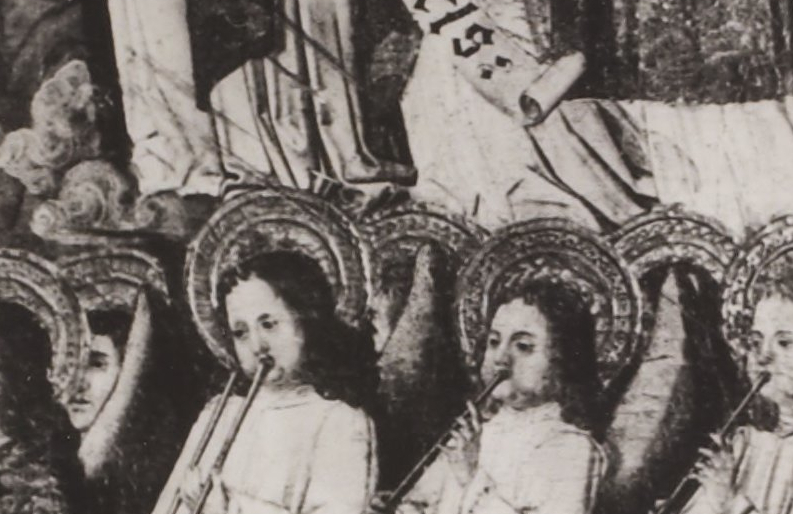 I just took another look , and found the bell on the left-facing trombonist as well! If you look at the player’s left hand, there is a third tube below the slide that ends in a bell flare at the player’s right wrist. It’s so tiny! Good eye! I think you may be right on both, although a better reproduction would be helpful. What are your thoughts on the others? Can’t see anything on the other two… I think you may be right about the obscured rear-facing bell for the mounted musician, but the Giovanni fresco is tantalizingly sketchy. I want to say there’s a trace of a bell shape between the angel’s fore and middle fingers. Could a bell have been covered in a touch-up along the way? Here’s an update on one of them: Trombone Bell Found: An Early Rear-Facing Trombone.